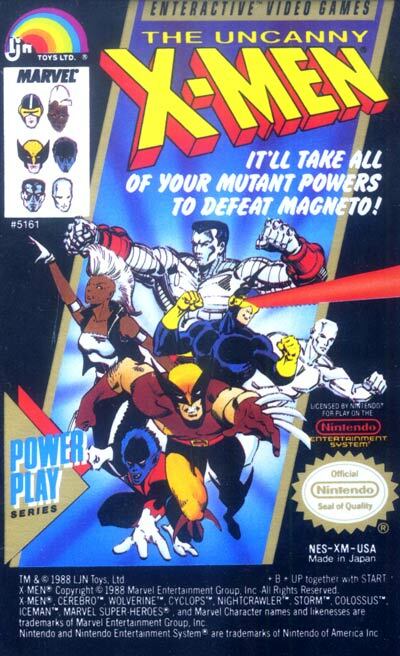 The object is to use several X-Men characters, each with special powers, to complete a series of missions. The powers of each character come in handy on particular missions. For instance, Cyclops' eye-beam is useful on the factory level. The game allows for either one or two players. Each character had an unlimited attack (either a punch or some type of projectile) and a special move that used on their energy and would kill the character if it was used up too much. The game required the player to fight their way to the boss in each stage, sometimes requiring the collection of items such as keys. After the boss was defeated, the player then had to quickly fight their way back to the beginning of the level before a bomb went off. Adding to the game's frustration was the fact that the final level could only be accessed with a secret code.